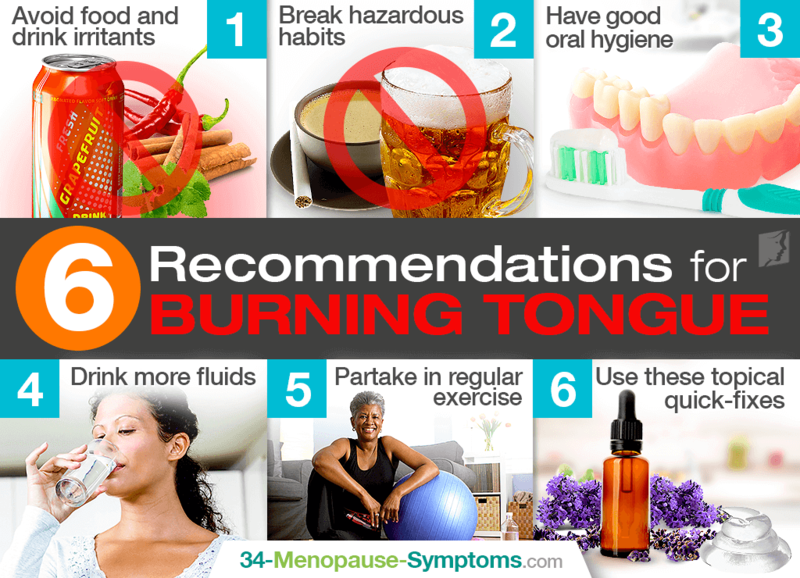 Burning tongue, also known as burning mouth syndrome, can really wreak havoc on concentration, comfort, and peace of mind for women passing through the menopausal transition. Luckily, management and treatment options are extremely accessible. Read on for burning tongue recommendations to seek relief from your chronic mouth woes, including what you should give up and what to put in its place. Acidic products like tomatoes, orange juice, or coffee are known to worsen burning tongue. Spicy foods with cayenne and those containing mint and cinnamon can also aggravate the symptom. In addition, it's also best to avoid carbonated beverages, which can dehydrate an already dry mouth. Reducing tobacco, alcohol, and caffeine intake can lessen the effects of burning tongue, as these products irritate the lining of the mouth, thus aggravating the burning mouth syndrome symptoms. Be careful of mouthwashes that contain alcohol as well. Proper oral care becomes an even higher priority when faced with burning tongue, especially for those who wear dentures. Replacing poorly fitting dentures as well as using mild or flavor-free brands of toothpaste can help to manage that frustrating tingling sensation. Many people experience burning tongue as a feeling of dry mouth that makes them increasingly thirsty. Act on that impulse to drink by upping your water intake, which hydrates the mouth to help ease discomfort and promote saliva production. Sucking on ice cubes can also work. Many cases of this condition are caused by hormonal imbalance, notably in postmenopausal women. Regular exercise not only benefits overall health, but also aids in regulating the endocrine system and reducing menopause symptoms. Some research also suggests that stress and anxiety can be factors that lead to burning tongue. Lavender oil and glycerin gel can cool down the affected area. Though less effective in the long term, some recommend lavender oil and glycerin gel as topical treatments for fast-acting relief. A thin application of either substance can cool down the affected area and let you get on with your day. What are Other Burning Tongue Remedies? If simple lifestyle changes aren't enough to offer proper relief, other natural burning tongue treatments do exist without having to take out a prescription or undergo surgery. Women suffering from burning tongue can tackle the root cause of hormonal imbalance with alternative medicines. These include phytoestrogenic herbal supplements - black cohosh, red clover, etc. - that fill the hormonal gap or hormone-regulating supplements, like Macafem, which encourage the endocrine system to produce its own hormones, thus relieving burning tongue and other menopause symptoms. Also, for help coping with the pain, it may be useful to join a chronic pain support group to remind yourself you're not alone. Social activities can also get your mind off the tingling sensation as you concentrate on other things. With proper initiative, one can be rid of their symptoms with these burning tongue syndrome remedies for good. Instill them into your daily routine today for relief starting now. Read on for more information about burning tongue syndrome and how to treat it. Burning tongue sensation has a number of causes and treatments. Click here to learn more.